The Village of Lewisburg will be welcoming a new non-medicated feed manufacturing plant in the Spring of 2019. 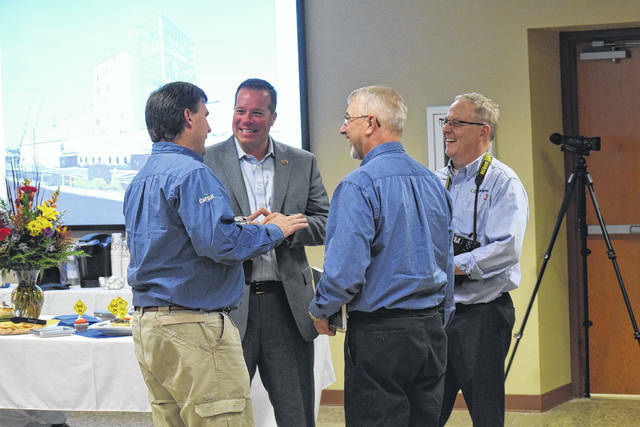 Cargill and Provimi held a ground breaking ceremony on Wednesday, Nov. 8, where they shared information on the anticipated plant. LEWISBURG — The Village of Lewisburg will be welcoming a new manufacturing plant in the spring of 2019. Cargill and Provimi held a groundbreaking ceremony for a new Lewisburg West Manufacturing Facility on Wednesday, Nov. 8. While the manufacturing plant will be new, the site will not. 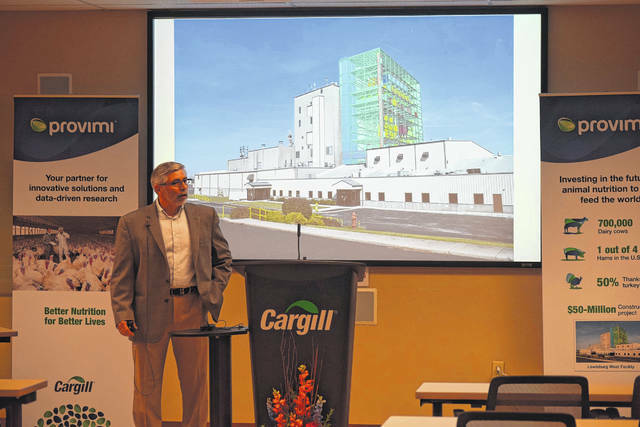 In a bid for sustainability, Cargill will be using the existing facility at 6571 Ohio 503 in Lewisburg. The site will be the only fully non-medicated animal feed plant in the U.S. and will allow Cargill to have one facility dedicated to medicated and one facility dedicated to non-medicated. Dean Barker, Business Operations Director with Provimi U.S., opened the ceremony by having Mike Thornton, Provimi Senior Engineer, give the audience a quick safety brief. Barker then took back the microphone to share a brief history of the Cargill plant as the area currently knows it. “There is a lot of misunderstanding about what this business really does. This plant over here in Lewisburg has been around since the mid-1970s. It used to be called Carl S. Akey,” he said. “A lot of people who have been around here for a while know that name and they were one of the largest employers for Lewisburg for a long time. Barker then transitioned into the former Iams Pet-food Plant, which will soon be known as Lewisburg West Manufacturing Facility. 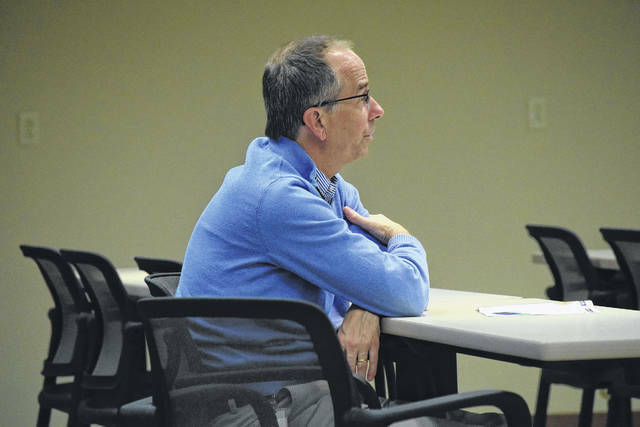 “It also used to be a major employer in the Lewisburg area. I think I heard that it employed three hundred people at one point,” he said. “P&G owned this business up until they closed the plant and then we purchased it about three years ago. We purchased this plant and the property around it with the purpose of doing a major expansion project. He added, Cargill acquired Provimi in late 2011. 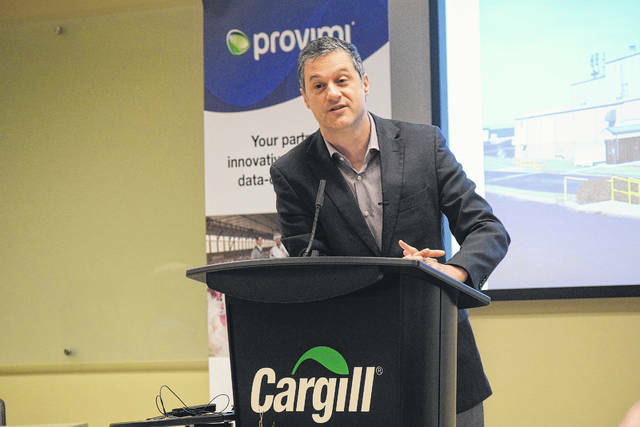 It was an opportunity for Cargill to expand and Provimi to become global. According to Barker, without Cargill the expansion project would not have been possible, as Cargill has a passion for expanding. Next, Managing Director Tom Taylor took some time to talk about the reach that Cargill and Provimi have and the level of impact Lewisburg’s plant has on the industry as a whole. “If you look at just the U.S. business, it is a 120,000,000-ton feed business. Think about that, 120,000,000 tons are produced throughout the U.S. This plant will touch about 50,000,000 tons. Just a little under half the feed that is produced in the U.S., that is what a plant like this will touch,” he said. “Cargill has roughly 200 feed mills throughout the world and we have roughly 20,000 employees throughout the world. We reach half the animals in what we call our pre-mix business and the other half through our compound feed business. Provimi is interested in nourishing the world in a safe, responsible, and sustainable sort of way. Adriano Marcon, Group Director of Premix Nutrition, discussed the plant as a dream that started years past and is now coming to fruition. “How can this plant effect what America eats every day? Like [Taylor] said, this plant will touch 40 percent of the feed produced in America. 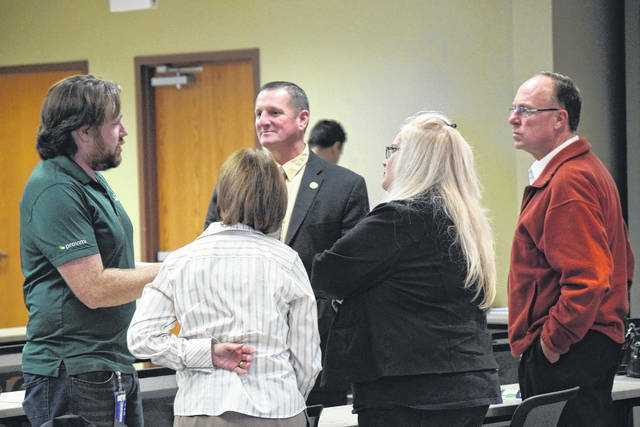 I would say, without being wrong, that what we do here today and what we will do here in two year out, will make Lewisburg the animal nutrition capital of America,” he said. To Thorton, Carl Akey started the mission Cargill finds itself on now. “We’ve grown on the philosophy that the company was originally built on. That plant will still make medicated feed, there is still a market and a need for that,” he said. “The goal was to make a world-class premix plant and we did that. We held a global collaboration meeting and what you will see today is a result of that. “We are going to build a 160-foot tall tower just to the south of the existing slip form when you walked in. That existing one is 110 feet tall, so we are going 50 feet higher than the concrete tower. It is to house the precision micro-dosing system for 105 vitamins and minerals at the very top. It is top-down construction. We eliminate carry-over and we can improve our precision. 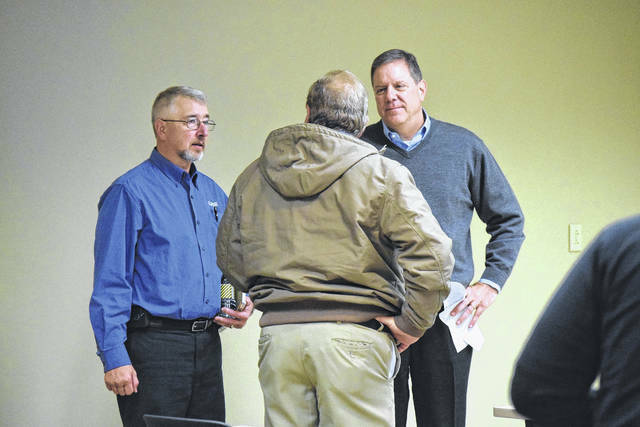 https://www.registerherald.com/wp-content/uploads/sites/41/2017/11/web1_Cargill1-2.jpgThe Village of Lewisburg will be welcoming a new non-medicated feed manufacturing plant in the Spring of 2019. Cargill and Provimi held a ground breaking ceremony on Wednesday, Nov. 8, where they shared information on the anticipated plant.